JBL is one of world's oldest loudspeaker manufacturers, having started out as early as 1928. In the meanwhile, it has become a part of Harman International stable, as have other well known companies (such as Infinity, Mark Levinson, Proceed, Studer, AKG and others). To say that JBL is a famous company would be an exercise in understatement - it would be hard to find anyone involved in audio who hasn't heard or had some experience with their home or professional products. These days, JBL has grown to the point of catering for specific markets; thus, models available to the US public are not available elsewhere, and vice versa. This can produce some amusing situations. When I contacted JBL via their site and mentioned this model, I drew a blank - those people didn't seem to know what was I talking about. In truth, the same thing happened when I enquired after an integrated amp from their parent family, Harman/Kardon, which is not listed in their US list price - again, I never got any information where to look it up. This aside, you'll find their staff to be prompt in answering and very courteous. Anyway, this is a speaker for the European market. Rather than ship large and heavy boxes across the world, JBL assembles this and other models in their facilities in Denmark - hence the "Made in Denmark" line on the logo. Also very European is the general appearance of this speaker - it's tall, narrow and deep (100x21x31,2 cm), excluding the supplied spikes (which add another 3-4 cm to the height). These are made of brass, are substantial and double sided, and may be screwed on as required - on one side, they're rounded for placing on hard floors, and on the other side, they are spiked, for placing on carpets. This combination of narrowness and depth makes these speakers easy to blend into most surroundings, while the required volume is achieved by using substantial box depth. The net weight is also good - 21 kg per box. Nice. The boxes are made from medium density fibreboard (MDF) of good quality; I tried knocking them, but mostly hurt my knuckles. I'd say these were acoustically inert boxes considerably above average for their price class. Inside, each box consists of two chambers, and each chamber has its own tuning port, with both ports on the back of the box. This allows the designer to properly tune each driver for the desired effect. The cabinet employs bracing by virtue of its double chamber construction, however, bracing is always welcome as it helps in battling unwanted resonances of the cabinet. The crossover is a serious piece of work, obviously given considerable thought, not a hastily and lightly thrown together circuit, as is all too often true even where it shouldn't be. It uses air cored chokes and custom capacitors. The wiring doesn't use any exotic brand wire, but the wire used appears to be of very substantial quality and quantity (not telephone line thick as I have had the misfortune to see on occasion). The terminals, mounted down on the back, use heavy duty brass gold plated terminals, which will accept both banana plugs and cables up to 5 mm thick - good show. There are two sets of terminals per box, thus providing for either bi-wiring or bi-amping - just remove the brass connecting plates and go. There are only two finishes - one in black ash and one in natural beech. Both use real wood veneer. The front grill has an interesting construction. Instead of using a typical wooden frame, JBL has used stainless steel wire, which has extrusions on six points around the grill perimeter. When on, there is a 2 cm gap between the box and the steel frame, itself only several millimeters thick. Acoustically, this seems like a very good idea, as frame diffraction is reduced to almost nil (even though I still hate all frames, no matter what, I like to have nothing between me and the drivers). In addition, I have to admit the looks are fabulous, very elegant, and in real life much better than on the pictures. 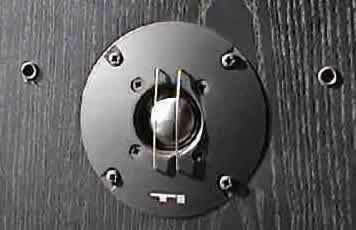 This speaker is a full three way system, on top of which it uses twin mid-bass drivers. Both have a 6,5 inch or 170 mm diameters, but as noted, use two different chambers; obviously the lower is rolled off earlier, but is also tuned to a lower frequency, a common arrangement, surprisingly difficult to get really right. These operate up to 800 Hz, where a 4,5 inch or 120 mm midrange cone takes over up to 2.800 Hz. There, the final crossover occurs to the 1 inch or 25 mm all titanium dome tweeter. JBL calls this unit a "pure titanium" dome, presumably to let us know that it has not been made of some other material and then, using vaporization processes, covered by titanium, but that it has all been made from pure titanium straight off the production line. Technologically, JBL says the bass drivers use Kapton voice coil formers for effective heat dissipation. The cones are made of pulp and are coated for stiffness, low mass and durability. The non-magnetic, mineral-loaded Polypropylene chassis is said to offer better performance than typical pressed steel chassis commonly used. Actually, this is good to know, as JBL pioneered titanium domes way back in 1984. JBL says you'll need some 120 hours of work to get the drivers up and running, but from experience, I'd say 3-4 months is much more to the point. It will be the titanium tweeter which will take longest to really settle down to its true sound. This combination of drivers and crossover provides for a nominal impedance of 8 ohms and a sensitivity of 90 dB/1W/1m, with a claimed frequency response of 40-22.000 Hz (no tolerance given). Because the reflex ducts are on the back, it's to be expected that the speakers will be sensitive to positioning, particularly in respect to the rear wall. And so it was. Put them near the back wall and you'll get overblown bass. Put them in a corner and you'll get a muddy, meaty bass. But make sure there's no less than 30 cm from the back wall and about the same from any side wall and you'll get what you paid for. The midrange is relatively insensitive to placement, as well as to on or off axis listening. Oddly enough, the tweeter is uncommonly insensitive to on or off axis, though of course it cannot be quite the same. However, I find that being up to approximately 30 degrees off axis will not significantly influence the tonal balance or sound stage depth, even if it does change just a little - in reality, it does change, but much less than is usually the case. Kudos to the designers for that. I tried several speaker cables, from standard Jamo OFC 4,5 mm cables to borrowed Kimber cable, the price of which is not mentioned in polite company (more than the speakers and the amp together). While the speaker obviously benefitted from better cabling, I would say less so than most other speakers I had dealings with so far. I take this to be a virtue. I also tried several amplifiers, from those belonging to myself, to some which were borrowed for a couple of days. This includes my Harman/Kardon 6550, a Yamaha AX 592, my own power amplifier, and models from NAD, Rotel and Sony. All but my own were stock units, so my results should be readily repeatable. Please note that I really pushed the speakers while biamping; at short intervals, they were fed something like 40-55W to the midrange and treble, and around 120-140W to the bass section. The window panes were objecting strongly by then, even if those were peaks only (I won't repeat what the neighbors had to say), yet the Ti600 remained in full control, no breakups, no sudden sibilants, no amp nasties. JBL says that recommended amp power is 10-250W; well, I don't know about 250W, but I guarantee 140W is just fine by those speakers, all they do is play far louder than is realistic anywhere else except on rock concerts. I imagine that with 250W on hand, you'll really manage those 110-112dB concert peaks. The first thing I want to know about a speaker is whether it will deliver the goods at very low levels, what I usually call "midnight listening levels". Well, the Ti600 did deliver the goods, but with a small imbalance - the high range was a little recessed in comparison with the rest of the spectrum. Not much, but enough to be noticable. In return, the mid and low range detail was very good by any standard, and certainly better than is common in its price class. My ancient AR94s, which in their day cost about twice the money, and which have recently been endowed with new and superior quality crossover capacitors (Sprague) and new driver suspension (the old one was shot) couldn't pull this trick off as well as Ti600. Using biwire I find all too often, despite claims to the contrary, does not produce any significant results - but sometimes it does work. Ti600 likes to be biwired if it cannot be biamped. Biwire it and the intial imbalance noted above will not actually disappear, but will sink to barely and only sometimes detectable levels. Also, a somewhat better perspective of soundstage depth will become available; nothing spectacular, but nevertheless, it's there, so you might as well use it. Now we're talking! Using my trusty old Harman/Kardon 6550 to drive the mid and treble drivers with its 50W per channel and my own power amp with its 100W per channel to drive the bass units, things got really rolling. I think this just about pushed the boxes to their sound quality (not power) limits, but I was pleasantly surprised just how high those limits were. Very fine details could be picked out, and female voices, especially that of Connie Dover, were downright sublime. However, these boxes did show up what amounts to JBL's signature in sound. Biamping tends to bring out the best in them, but also mercilessly shows their shortcoming very clearly. Simply put, these boxes are not of the most linear nature even in their price class - some imbalances do show up, like a slightly accented higher bass-lower midrange region, say 200-400 Hz, and a slight suckout around 1 kHz. Man, these boxes really can rock'n'roll! They are fast - in the treble, you expect it because of the titanium tweeter, but these boxes are fast all around. The speed and rhythm of their bass is typically JBL, and few can match them in those virtues (actually, in the last 25 years, I remember an RCF box which did it but cannot remember its model designation, and the much lamented Spendor BC3, which was always a speaker to die for). Of course, orchestral works also benefit from this speed, but not nearly as much as fast rock. With a single wire option, these are not boxes for classic music lovers, but modern music and rock fans will be thrilled. Once again, biwiring does clear up some inconsistencies of the sound stage. Some extra detail becomes available, and in this option, will classic music lovers please join us now? It now becomes possible to really hear into the mix, perhaps not as much as with some of the competition, but the competition does not often offer such rhythm and speed, such vivaciousness, joie de vivre as these boxes so willingly do. We now transcend from Hi-Fi to real audio art - not state-of-the-art, but art nonetheless. Biamping does improve things, always, sometimes more, sometimes less, and that's why it's used. Well, here it improves things not just more, but much more, insofar that it exploits the virtues of these boxed to the hilt. The Ti600 can sound anything from gentle to explosive, yet it never looses its composure, it just stands tall for what it is, and it can't help being counted. It's not ultralinear, it's not the most delicate speaker around, it's not the most balanced sound for the money - but I'll take bets that you'll be hard pressed to find another speaker which will better it in speed, high power composure, and pure joy of doing its stuff (in its price range, of course). As I said, it's not a particularly linear speaker. It has its shortcomings which are relatively gentle in nature, and it has its virtues, which are strong as they come from a strong bloodline. Ultimately, it depends what you want in a speaker that will determine whether it's right for you or not. If you subscribe to the British sound, relatively calm, composed, with usually good midrange, but almost always unimpressive bass lines and clean but unexciting treble, this is not a speaker for you, unless you want a change. If you believe in Danish sound, as epitomized by Dynaudio, and bearing in mind that in Denmark, others see/hear it differently (like Dali), you will find this speaker very strange and probably as unbalanced as your girlfriend/wife/mother, or whichever person of female persuasion is currently standing in the way of your audio bliss. If you're Italian, and drive a Fiat, you'll aspire to this model; if you're driving an Alfa, you'll find this a perfect analogue in the audio world in its at least biwired, or better still, biamped version (man, a 16 valve per driver, twin turbo speaker - 0 to 100 km/h in 3 seconds flat!). In short, this is not a terribly linear speaker, and it will not deliver incredible detail. On the other hand, its main vritue are breathtaking dynamics, a vivaciousness and plain joy it propagates when doing its job which are hard to find elsewhere. It's a very fast and dynamic speaker, with more than a trace of good rhythm in addition to its pretty low reaching bass drivers. It can play gentle music gently, but if need be, it can rock'n'roll with the best of them. It has a fairly good sound stage depth and uncommonly good dispersion up to a point - I expect those little fins over the tweeter are doing something about it. However, bear in mind that the tweeter will take an unusually long time to settle in, something like 2-3 months is not unrealistic. Be patient and you will be rewarded with an above average sound. This is a speaker for the young at heart. It will do all kinds of music, but it's true that it prefers modern music to classical works. Its rendition of voices is above average, as is its bass performance in both speed and control. However, it really needs at least biwiring and better still, biamping to deliver its best. It's a very tolerant speaker and will be driven by almost anything, though of course it will benefit from quality drive. If all this sounds like great fun - it is. A true JBL with an European touch. A good one then, which needs time to settle in, not too linear, but easy to drive, very lively, authoritative and happy to be of service - much fun to listen to.